James Taylor discusses the four specific principles that are at the heart of identifying and building Decision Management Systems. Organizations that have adopted Decision Management Systems have gained tremendous results from doing so. The use of business in Decision Management Systems has given organizations the agility to respond rapidly to competitive and market changes, to avoid business risks, and to take advantage of narrow windows of opportunity. The use of analytics to predict risk, fraud, and opportunity in these Decision Management Systems has kept companies profitable despite the risks they face and has allowed them to maximize the value of their customer relationships through a laser focus on opportunity. The ability of Decision Management systems to adapt to change and to be part of a learning environment has allowed organizations to experiment with new approaches, learn from their successes and failures, and continuously improve their business. Any organization would want the benefits of these kinds of systems. However, it is not immediately clear how to build Decision Management Systems. Although there are specific technologies involved, the use of these technologies is not sufficient to ensure that Decision Management Systems are the outcome of using them. Decision Management Systems appear to deal with different issues, and have different characteristics, across different industries and business functions. It can be hard to see what an underwriting system in use by the agents of a property and casualty insurer has in common with a real-time offer management system supporting a website. Yet when the basic principles of Decision Management Systems are understood, they can be correctly identified and delivered with maximum return on investment. Four specific principles are at the heart of identifying and building Decision Management Systems. If a system exists, it can be assessed against these four principles and can be said to be a Decision Management System if these principles guide its design and implementation. If an information systems project is being considered, then the integration of these principles into the project will ensure that what is delivered is a Decision Management System. Decision Management Systems are built around a central and ongoing focus on automating decisions, particularly operational and “micro” decisions. The way Decision Management Systems make each decision is both explicable to non-technical professionals and easy to change. Decision Management Systems use the data an organization has collected or can access to improve the way decisions are being made by predicting the likely outcome of a decision and of doing nothing. Test, learn, and continually improve. The decision-making in Decision Management Systems is dynamic and change is to be expected. The way a decision is made must be continually challenged and re-assessed so that it can learn what works and adapt to work better. Most information systems have been developed, and are continuing to be developed, around business functions, business data, or business processes. Functional systems support a set of related business functions such as accounting or human resources. Data-centric systems focus on particular kinds of data, such as customer information. Business processes such as order-to-cash have been layered on top of both kinds of systems, and newer systems are developed to deliver additional specific business processes. Each of these approaches has pros and cons, but they all share a common challenge—they assume either that people will make all the decisions involved in the functions and business processes being automated or that how these decisions are made can be fixed. As a result, none of them are Decision Management Systems. To develop Decision Management Systems, we must take a different approach—not one based on functions, data, or processes. To develop Decision Management Systems we must begin with the decision in mind. Decision Management Systems are built to automate and improve specific business decisions. As a decision involves making a selection from a range of alternatives, these systems make that selection—they choose the action or actions that can or should be made given the data available and the context of the decision. Decision Management Systems do not assume that every decision must always be taken by a human. Decision Management Systems make these decisions using the same business logic humans would apply without human intervention. Clearly, however, we are neither willing nor able to build information systems to make every decision on our behalf. Only certain decisions can and should be addressed by Decision Management Systems. What Kinds of Decisions Are We Talking About? Information systems are good at handling repetitive tasks. They excel at doing the same thing over and over without variation and without making mistakes from one transaction to the next. Something that cannot be defined in a repeatable way is not a good target for any kind of information system; thus, only those decisions that are repeatable are good candidates for being automated and managed using a Decision Management System. Strategic decisions are those high-value, low-volume decisions that guide the overall direction of the company. These ad-hoc, typically one-off decisions are made by senior management or the executive team of an organization. Lots of information is assembled and analyzed while many options are considered. Once the decision is made, it is never made again in the same context—even if it is revisited later, this is really a different decision as circumstances are different. Organizations may know that a strategic decision is going to be needed well in advance, but often these decisions arise from unexpected opportunities or challenges. Strategic decisions are not candidates for Decision Management Systems as they lack the key element of repeatability. Tactical decisions are those focused on management and control. These medium-value decisions still have significant business impact. They too involve data and analysis, typically by humans in management or knowledge worker positions. However, these decisions do repeat—the same kind of decision is made repeatedly during normal business operations. Decisions about the discounting approach being used or the staffing levels of a call center might be examples, and these decisions must be made every month or every week. The same or very similar analysis is performed each time, and company policies may play a significant role in how the decision is made. More repeatable and consistent tactical decisions are certainly targets for Decision Management Systems. Operational decisions are those of lower individual value and typically relate to a single customer or a single transaction. They are critical to the effective operation of an organization, especially an organization of any size. Because of the number of times they must be made, consistency and repeatability are critical. Policies and well-defined decision making criteria are typically developed to ensure this consistency. Despite their low individual value, they are extremely valuable in aggregate. A decision made thousands or millions or even billions of times a year has a total value that often exceeds even the most important strategic decision. Furthermore, strategic and tactical decisions (for example, to focus on customer retention or discount more aggressively) will only have an impact if a whole series of operational decisions (how to retain this customer or what discount to offer this distributor) are made in accordance with the higher-level decision. For these reasons, operational decisions are the most common subject of Decision Management Systems. To begin with the decision in mind, we must understand what operational or tactical decision is to be the focus of our Decision Management System. This focus on repeatable operational and tactical decisions can and should be combined with a focus on business strategy. A business strategy must be supported by many operational and tactical decisions if it is to be put into practice. For instance, if a focus on growing per-customer revenue is central to your business strategy, then there may be strategic decisions that must be made to support this strategy. There will definitely be many operational and tactical decisions that will be influenced by and contribute to this strategy. For example, unless operational decisions about customer retention and cross-sell offers are made effectively, you cannot deliver on this customer-centric strategy. As discussed in chapter 5, “Discover and Model Decisions,” the right operational decisions to focus on are those that support the objectives and key metrics of the organization. Operational decisions are by far the most common kind of repeatable decision. Every order placed, every customer interaction, every claim, or credit card transaction involves operational decisions. Operational decisions are the day-to-day, run-the-business decisions that are taken in large numbers by every organization. Operational decisions are highly repeatable—in fact, being consistent by following a set of guidelines or applying the relevant policies and regulations is a defining characteristic of an operational decision. Operational decisions can also involve an assessment of risk, as many forms of risk (loan default or credit risk, for instance) are acquired one transaction at a time. Operational decisions often must be made in real time or near real time, while customers are waiting for the decision to be made. Although many operational decisions are made about customers, they can also be made about shipments, suppliers, or staff. As more physical devices are connected to the Internet with sensors or RFID chips, operational decisions are often made about “things”—about vehicles, packages, railcars, or network components. Micro decisions are a particular kind of operational decision (Taylor & Raden, 2007) where the desire to personalize an interaction with a customer requires a focus on making a decision for that customer and that customer only. Often an operational decision is repeated for all customers, with the decision being based only on the data available for the particular interaction or transaction concerned. A micro decision, in contrast, uses everything known or predictable about a customer to make a unique decision just for them. Two customers making the same request or involved in identical transactions would get two different outcomes. This focus on the information about the customer is what makes micro decisions a distinct form of operational decision. Everything known about the customer must be synthesized into actionable insight about the customer and fed into the operational decision alongside the information about the transaction. For example, when an order is placed, two operational decisions might be made—what shipping options to offer on the order and what discount to offer. The first of these might be managed as a standard operational decision with information about the order such as delivery address, weight, and value used to determine which of the various shipping options would be allowed. The second could be managed similarly but could also be handled as a micro decision. The customer’s history with the company could be used to compute their likely future profitability and the risk that they might consider a competitor. This information, as well as information about the specific order, would then feed a micro decision to calculate a discount specific to this customer placing this order at this moment. Although most repeatable decisions are operational or micro decisions, some are more tactical in nature. These repeatable tactical decisions often relate to management control of operations, such as assessing the staffing level required by a call center for the coming shift. They may also include knowledge worker decisions, such as those in clinical situations where a doctor is advised as to the likely interactions of a set of medications she has just prescribed to a patient. Although these tactical decisions are not as high-volume as operational or micro decisions, they are often of slightly greater value and so still offer an opportunity for Decision Management Systems. Another set of tactical decisions under managerial control are those for revising the decision criteria used in operational decisions. The world is dynamic, so the decision criteria for operational decisions need to change regularly. For example, customer preferences and fraud patterns change over time, as do the criteria for deciding what offers are to be made. Some tactical decisions are about setting the right decision criteria to be applied in an operational decision. Because these systems are more complex and less repeatable, however, it is likely that the system will not completely automate the decision. Instead it will guide and support the decision maker by restricting the available options or by focusing them on a specific set of information, which will be useful to making the final determination. Operational decisions are made every time a business process or transaction executes, and tactical decisions are made periodically to change operational decision criteria or to attend to exceptional business situations and take corrective actions. Over a longer horizon, this is not sufficient to improve business outcomes. Business strategy guides tactical and operational decisions and may need to change to respond to the dynamic marketplace and the external world. For example, competitors may introduce new products and services, influencing customer choice and putting competitive pressure on revenue and profitability. This may mean changing business strategy around providing targeted discounts and customizing products. 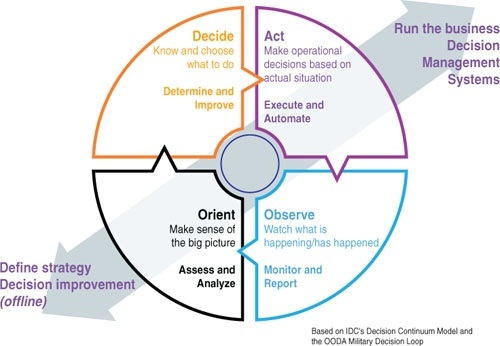 This in turn creates change in processes and associated operational decisions. These strategic, tactical, and operational decisions must be aligned. Figure 4-1: The Decision Lifecycle From strategy definition to decision automation. If We Are Talking About Decisions, Aren’t We Just Talking About Decision Support Systems? The line between Decision Management Systems and Decision Support Systems (or Executive Information Systems) can be blurry. This is especially true when considering the kind of Decision Management System that handles tactical decisions, or where an operational decision is not completely automated—where the user is presented with multiple valid options, such as possible offers to make. Decision Support Systems provide information that describes the situation and perhaps historical trends so that humans can decide what to do and which actions to take. Decision Management Systems automate or recommend the actions that should be taken based on the information that is available at the time the decision is being made. The policies, regulations, and best practices that determine the best action are embedded, at least in part, in a Decision Management System where a Decision Support System requires the user to remember them or look them up separately. The information and insight presented in a Decision Support System is typically backward looking, and Decision Support Systems are generally reactive—helping human decision-makers react to a new or changed situation by presenting information that might help them make a decision. In contrast, Decision Management Systems use information to make predictions and aim to be proactive. Learning is something that happens outside a Decision Support System and inside a Decision Management System. Users of Decision Support Systems are expected to learn what works and what does not work and to apply what they learn to future decisions. Decision Management Systems have experimentation or test-and-learn infrastructure built in so that the system itself learns what works and what does not. Decision Management Systems are integrated into an organization’s runtime environment. They make decisions for applications and services in the organization’s enterprise application architecture. In contrast, Decision Support Systems are often desktop or interactive applications that execute outside the core application portfolio. Why Don’t the Other Approaches Work? Before considering the remaining principles, it is worth considering why it is essential to begin with the decision in mind. What is it about a focus on functions, on process, or on data that prevents the effective development of Decision Management Systems? One traditional approach to building systems is to focus on a cluster of related functions—those to do with human resources or those to do with managing a factory, for instance. Such systems contain stacks of capability focused in one functional area and owned by a single functional department. This approach could result in the development of Decision Management Systems if the decisions involved were wholly contained within a single business function. However, while some decisions are concentrated in this way, many cut across functions. A discount calculation decision, for instance, might involve inputs from supply chain functions, from finance, and from customer management. As such a focus on functions will rarely identify and encompass decisions in a way that lends itself to the construction of Decision Management Systems. Functional applications have gradually fallen from favor as organizations have moved to focus on end-to-end business processes. Business processes such as “order to cash” or “issue policy” often cut across several functional areas, linking elements of one function together with elements of another to create a useful business outcome. Although this cross-functional approach can help with the identification of decisions, a pure process focus tends to entwine decisions with the process itself. If no real distinction is drawn between decisions and the processes that need those decisions, it is hard to create true Decision Management Systems. A strong separation of concerns, keeping business processes and decisions linked but separate, is required if enough of a focus on decisions is to be maintained. Some processes keep decisions separate and manage them separately by assigning these decisions to people in manual process tasks. A focus on human decision-making, even in high-volume operational processes, also does not result in the construction of Decision Management Systems. Particularly when constructing their own custom systems, organizations often focus on the data that must be managed. These systems become focused almost entirely on the management of the data elements or entities concerned. Providing what is known as CRUD functionality (Create, Read, Update, and Delete) for the core objects becomes their rationale. The data contained is managed only so that it can be edited and displayed while analysis is limited to reporting. Such systems often provide data for decision support systems but they, like process- and function-centric systems, defer decision making to actors outside the system.